Joy is a mouth breather and was wondering if she breathes irregularly. So she got one these new $150 fitness tracker “Spire” to monitor her breathing and emotions — stress levels — as well as her steps. It has notions: When Joy did a backbend today, a pop-up message immediately suggested she calm down. The Spire said she hadn’t been calm for hours. “Who says I’m not calm!” Joy is demanding as we type. Spire looks like one of those smooth flat stones you pick up on river bottoms; it has a clip to attach to your shirt or pants. It goes with an app for your iPhone or iPad. (Android app coming up soon.) The app shows three flower petals, in three colors, for calm, focus and activity. When you’re balanced, all three fill with color. If only one or two have color, it indicates which area needs improvement. You decide whether you’re going for super calm, super productive, and super active. For the first few hours, “calm” and “focus” barely registered, but began to pick up as the day went on. 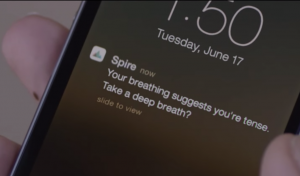 The bottom line: Spire gave us a lot more information than we needed. Joy achieved super calm in seven hours. (Namaste.) Checking the app became addictive, and may have made us less calm at first. The company has a 30 day return policy if you don’t like it. We bought it at Spire.io, but it’s also on Amazon.